The Paleozoic Era is the beginning of an explosion of life forms. The Cambrian Explosion marks the era with thousands of new life forms in the ancient seas. There was certainly life before the Cambrian Period. There were even many complex life forms. In late Precambrian time was a period called the Ediacaran. Ediacaran fossils are found in the Ediacaran Hills of Australia, Northwest Territories, Yukon, British Columbia, and Newfoundland in Canada. There are many different types of Ediacaran fossils. What distinguishes these fossils is that there are no hard body parts to fossilize. This makes them very rare. Generally soft tissue disintegrates long before fossilization can take place except in these few locations. The other distinguishing characteristic is that Ediacaran life forms are nothing at all like those of the Cambrian Period! It is this characteristic, life in the ancient sea, which distinguishes the Paleozoic Era from all others. You see, the autotroph’s (cyanobacteria) makeup didn’t just add oxygen to the atmosphere. It was an entirely new sort of cell structure: one that had a cell membrane or wall (or both) that enclosed a central nucleus. Today we call this a eukaryotic cell. These new cells could now join together to do specialized tasks, the kind of specialization needed to make the tissues of plants and animals. Now species could exist that responded to the diversity of their watery environments. Some would live on the bottom sediments, burrowing with tube-shaped bodies or walking with many tiny legs. Others would live in the ocean column, developing fins for effective swimming like the pikia pictured here, a chordate from the Paleozoic Era Cambrian Period. Many phyla were represented in the Paleozoic Era. In fact all of the phylum in today’s world were represented during the Cambrium Period. Some of those representatives including: arthropods (Trilobites were everywhere! ), mollusks, Lophophorata (Brachiopods), appeared almost immediately in the Cambrian while Orthoceras-a straight-shelled mollusk-came in around the Ordovician Period), echinoderms (The flower-like crinoid thrived in seas throughout the Era.) 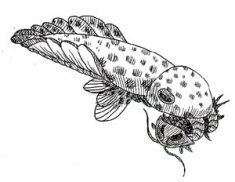 and, eventually, fish in the Devonian Period(. All of them had specialized tissues for performing the functions of their bodies: eating, breathing, moving, and reproducing. 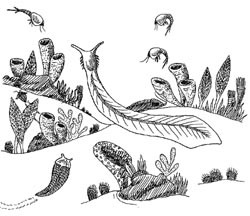 Plants and animals first moved onto land in the Silurian Period. But they didn't really flourish there until the Carboniferous Period when huge forests covered the land. These forests were so dense and covered so much of the earth that oxygen was 35% of the atmosphere compared to present day levels of 21%. It is this high oxygen content that is believed to be the cause of the gigantic arthropods that lived in these forests. 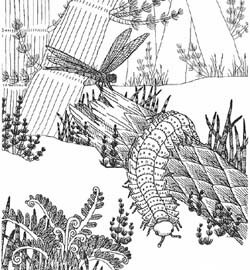 A dragonfly called Meganeura had a wingspan 70 cm! The centipede like Arthropleura could reach a length of 1.8 meters and giant scorpions grew over 50 cm long. Of course there were an abundance of insects of sizes we would find unremarkable as well. The high oxygen content may have made it easier for the amphibians that also left the water during the carboniferous period. These four legged creatures called tetrapods lived at the waters edge. The tetrapods became very successful evolving many different forms some of which grew quite large over 2 meters in length! They became the dominant life forms in the lakes, rivers and swamps of the Carboniferous Period. The first reptiles showed up late in the Carboniferous Period as well but they did not play an important part during the Paleozoic Era. Life on our planet wasn’t exactly like that of today during the Paleozoic, but the similarities had arrived. Earth’s miracle of life had begun and was taking hold in ancient seas of the Paleozoic. There was great diversity in the oceans and on land as well. Change is the way of life and the end of the Permian Period, the last of the Paleozoic Era brought about great changes. Near the end of the Paleozoic Era was an event called the Permian mass extinction. At this time about 95% of all living things on earth became extinct! This ending made way for a new time and new life forms.